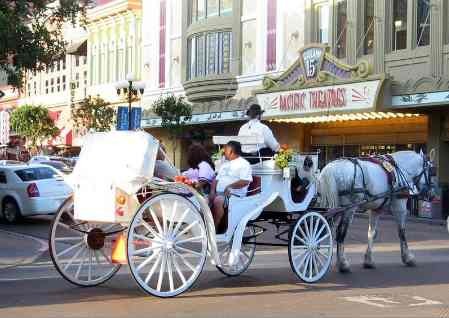 The Gaslamp Quarter San Diego is a great place to start your visit to San Diego California, whether you are looking to dine out, be entertained or just get out and explore. With its history dating back to 1850, this particular area of SD is listed as the Gaslamp Quarter Historic District in the National Register of Historic Places. While the 16½ blocks of what is known as the Gaslamp District has undergone more than one urban renewal, it is now a thriving and entertaining place for both locals and visitors to the area. 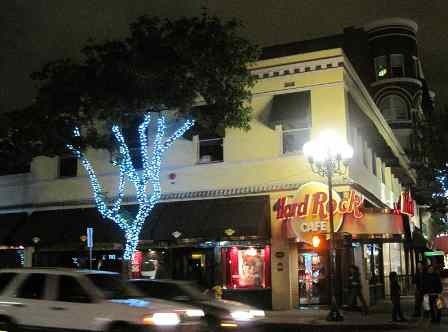 There are many great San Diego Gaslamp restaurants for breakfast, brunch, lunch, happy hour and dinner. Pull out your iPhone and read the reviews, or follow our advice and choose one of these best Gaslamp Restaurants in San Diego CA. The Shout House – Kick back with a group of your friends or family for a night of classic rock dueling pianos. Don’t just sit there…..get involved! Go ahead and make your favorite song request and then jump right in and join the party. Nothing but fun can come from such a diverse crowd of people of all ages. The Shout House is located at 655 4th Ave., 877.603.6071. Petco Park – The park opened in 2004 as the home to the San Diego Padres. You can’t go wrong with the amazing views of the bay and skyline along with a venue of fun events to attend. Petco Park will be hosting the Season 11 Auditions for American Idol. So, go ahead and find your way down to Petco Park for some unforgettable memories. Petco Park is located at 100 Park Blvd. Phone ahead for Padres ticket information at 619.795.5005 or email tickets@padres.com. If you are interested in private event information call 619.795.5025 or email events@padres.com. Double Deuce – Pull on your boots and grab your hat and honey and head on down to Double Deuce where there is a little something for everyone. With 4 levels and 2 rooms you are sure to have some fun. If you are a little bit country and a little bit rock‘n roll, no problem, they have it all. We’re all here to party seems to be the motto. Double Duece is located at 528 F Street, 619.450.6522. Altitude Sky Lounge – Check out what is happening atop the Marriott at Altitude Sky Lounge! It’s a whole new way to look at San Diego from 22 stories up. The views of Petco Park, Coronado Bridge and Island as well as Point Loma are amazing. Happy hour is Monday through Friday 5p.m. to 7p.m. and all day Sunday with great drinks and a menu of appetizers that are sure to please. Begin your night with dinner at Soleil @k. Check out the DJ Schedule while enjoying the ambiance of the warm glow from the fire pit. Put on your shopping shoes and plan for a full day. From the surfer type to the boutique shopper, you will not be disappointed. Add a touch of practicality with stores catering to those “forgot to pack” items for your stay away from home. You will find just about anything and all within an inviting walking range. The Gaslamp District holds bragging rights to more than 70 retail stores and many unique and fun places to shop. Treat yourself to this unique shopping experience. While this list could go on and on we suggest you get out there and start shopping. See you at the Gaslamp Quarter in San Diego!